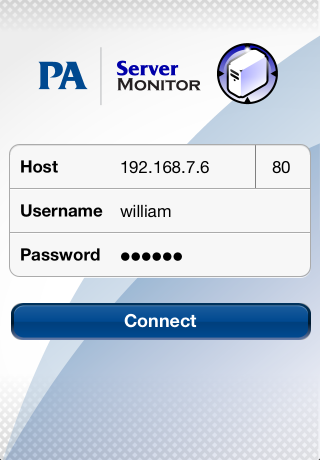 A free iPhone application is available for PA Server Monitor to help you keep track of your servers and network while on the go. 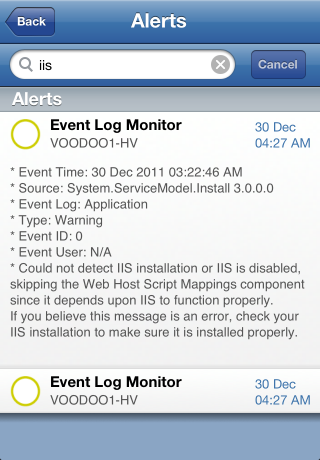 Receiving iPhone Notifications is also possible by installing the application. Log in to the application using the same server settings and credentials as you would use when running a Remote Console. 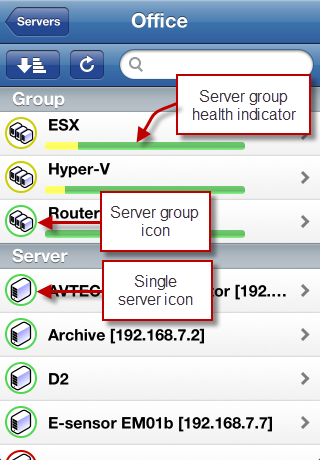 Click the Servers button to navigate through your servers and groups. The group health bar gives you a rough idea of the health of the servers within that group. 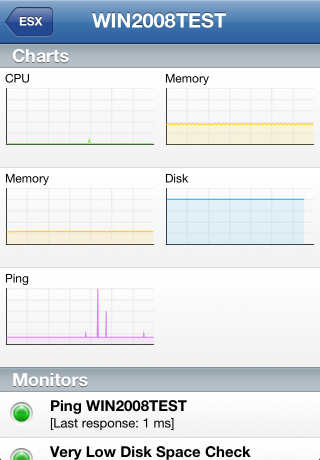 The more red or yellow you see, the more servers that have one or monitors that are in the error or alert state. Clicking the sort/group button in the upper left brings groups with problems to your attention by listing them first. 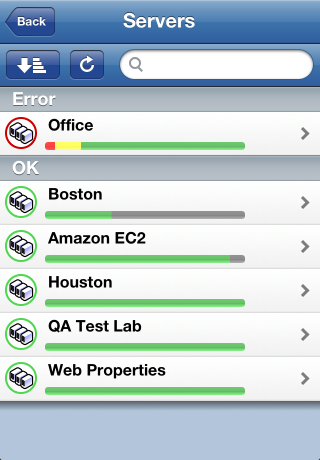 In the image above, the Office group has some some error and a few more alert monitors somewhere. Clicking that group will drill down to the Office group. Drilling down to the Office group shows the EXCHANGE01 server is red, which means one or more monitors on that server are red. You can click the server to drill down further. A couple of other groups within the Office group have some yellow -- they will need to be investigated as well. 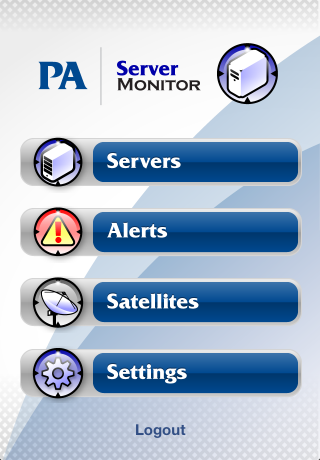 Clicking an individual server will show charts for that server (if any), monitors with their current status, and recent alerts at the bottom. Individual charts can be clicked to zoom in. 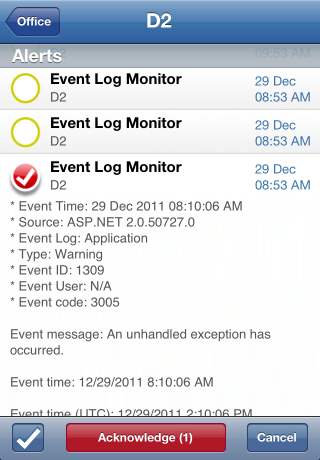 Scroll down to the bottom of a server view to see recent alerts. 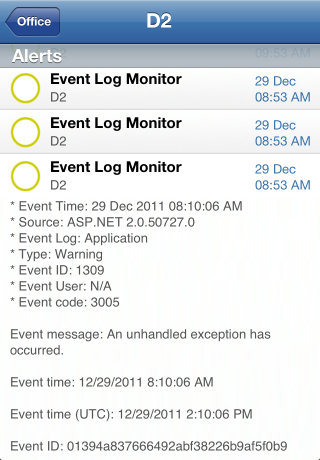 Click individual alerts to expand them and see more details about the alert. 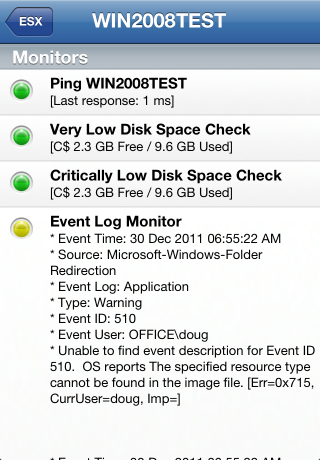 Click the circle at the left to select the alert to be acknowledged. 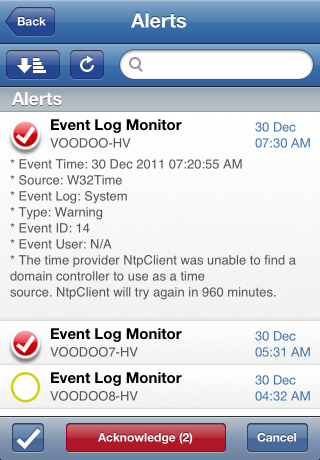 You can also press the Alerts button on the home screen to see a global list of recent alerts. 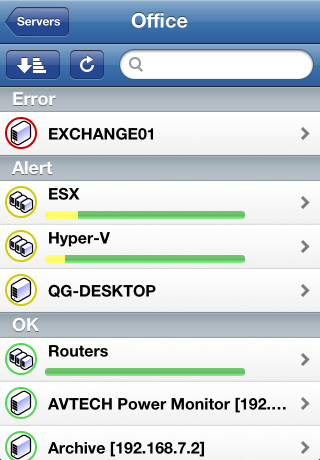 These alerts can be sorted/grouped just like servers. They can also be acknowledged. And, using the search bar, you can filter for entries that contain the specified text.